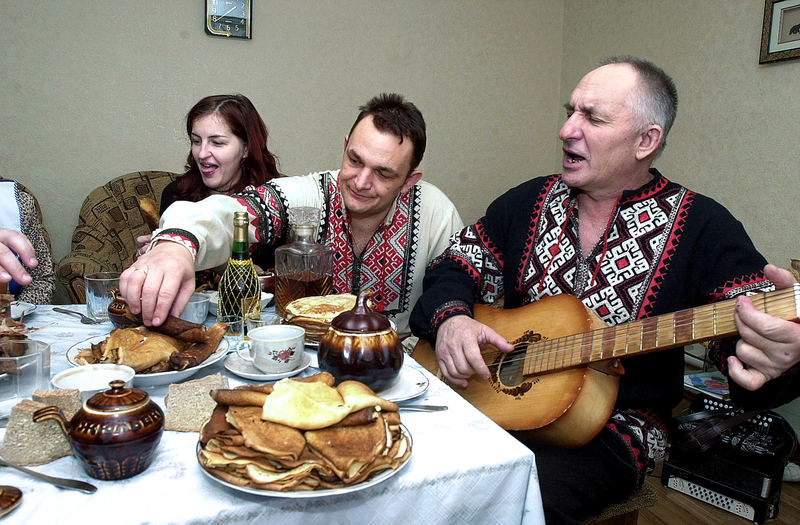 Photo: Smorodino Village (Belgorod region, Russia) peasants celebrate Maslenitsa (Pancake Week). Pancakes or bliny, flat thin cakes made of batter, are traditionally made during week-long Maslenitsa celebrations. If you believe the stereotypes, the Russians are a gloomy, unwelcoming and introverted bunch. However, in reality Russians treat their friends with great warmth and have them over to visit or spend the night all the time. If you’re lucky enough to receive an invitation to a Russian’s home, then have a look at our guide – these rules will help you make a good impression on your hosts. 1.Visiting friends is a Russian institution that, like many other Russian institutions, is founded upon personal relations. Of course, there are universal rules of conduct that must be obeyed, at least for the first couple of visits with your host, such as setting up a date and time of arrival in advance. Once this hurdle is cleared everything becomes much simpler. It’s considered good manners to give advance warning of your arrival at least 15 minutes beforehand. If circumstances don’t allow for this, then make sure to give five minute’s notice. And if you can’t manage even this, then at the very least give a knock before entering. 2. Guests are generally invited to keep their shoes on at first. You shouldn’t take this literally, though – your host is just trying to be polite. Every Russian family keeps a special cupboard full of slippers by the front door, where you can find pairs of all colors, shapes and sizes. Guests are generously showered with these slippers on arrival. Don’t offend your Russian friends: do them a favor and change your footwear even if the slippers they give you are size 13 and pink and fluffy with tassels. 3. If you’re staying in Russia and decide to have a big bash at your apartment (and what other kind of bash is there), then there are a couple of things you should consider. Before your guests arrive, it’s a good idea to knock around on neighbors’ doors to let them know that the noise coming from your apartment that evening is going to be louder than normal. Otherwise, you’ll soon start getting knocks at your door, and it won’t be the neighbors knocking, but the boys in blue. 4. If it has gotten late and going home is too much of an effort or the subway has closed or you don’t have enough money for a taxi or you have some other great reason, then don’t think twice about staying overnight. Your host more likely than not will be very accommodating. The number of guests that a Russian host will allow to crash overnight depends less on the available floor space than on the amount of alcohol consumed. So you shouldn’t be surprised if when you’re hosting you find a Russian friend or two conked out on the sofa in the living room. 5.Another thing that you should be prepared for is that when you go to visit friends, you won’t just be met by friends and colleagues, but potentially also by parents, grandparents, sisters, brothers and other relatives. Russia hasn’t quite solved its problem regarding living space yet, so Russians still see it as normal for everyone to live together under one roof. The size of the apartment doesn’t seem to matter too much. 6. Russian hosts are very hospitable, sometimes overly so. It’s a good idea to turn up on an empty stomach – if possible stay away from food for an entire day before you visit. Because whether you’re hungry or not, you will be fed abundantly and insistently. You will have to eat everything on your plate, or you run the risk of offending your host who will then ply you with drinks instead. And by that, I mean with vodka. 7. One important rule that is always applicable, no matter your personal relations with the host, is that turning up empty-handed at a Russian’s house is not the thing to do. It’s up to you whether you bring a bottle of wine, fruit, meat or a cheese platter. You’ll have to eat some of it too, so choose carefully.